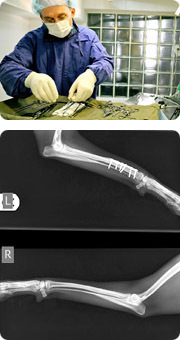 We routinely perform a wide range of soft tissue and orthopaedic operations. Safety is of paramount importance to us and to ensure that our patients receive the best care during surgery all of our anaesthetic patients are placed on IV fluids and given adequate analgesia (medicine to reduce pain). Our surgery table is heated to ensure that our patients remain warm during operations which helps to ensure successful outcomes and minimizes complications. We intensely monitor patients while they are under anaesthesia to ensure that early action can be taken if complications arise. We try our best to provide care for all unwell patients, including the non-furry ones.